I was really very late in choosing a recipe for this month’s Indian Cooking Challenge. I almost thought I will give a month’s break when I happen to talk to Pratibha. Over our conversation when she happened to ask about Indian Cooking Challenge, it struck me that I could choose a recipe from their book. When I asked her for a simple yet an authentic dish from their book, Pratibha was most generous to share this Guajarati Dal from their Award Winning book, Sukham Ayu – a vegetarian cookbook of easy & healthy recipes. 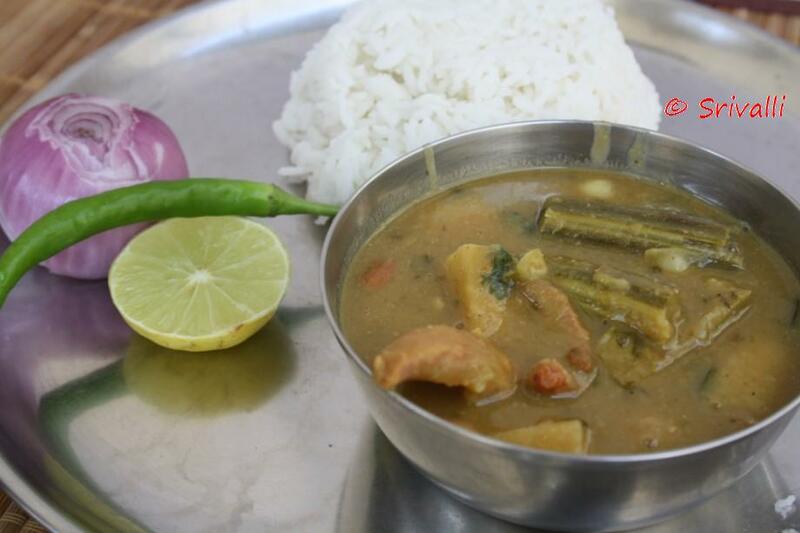 This is a dish that Jigyasa remembers from her childhood days and one that evokes wonderful memories. I am so excited to share that Pratibha and Jigyasa are happy to gift a copy of Sukham Ayu to One lucky dip Winner. Once all the members post this challenge on their blogs, the authors will check the participating blogger and select one by doing a Lucky dip. I will be announcing the winners once this is done. The book will be shipped to the winner. I will contact the winner through email for their mailing address. Disclaimer: I have not received any compensation in doing this review. I have only received an electronic copy of the recipe and all copyright lies with Jigyasa Giri & Pratibha Jain, Authors of Sukham Ayu. The recipe is reproduced here, though in my own words, with the Authors permission. Coming to the recipe, as expected I waited for the last weekend to try out this recipe but wanted to remain true to the ingredients and went in search to get those items that I didn’t have. Like the recipe called for Kokum, Dried Dates and yam etc. I have never cooked with Yam till now and I thought I should really take this opportunity to try it out. I couldn’t find Kokum but got Yam and dried dates. 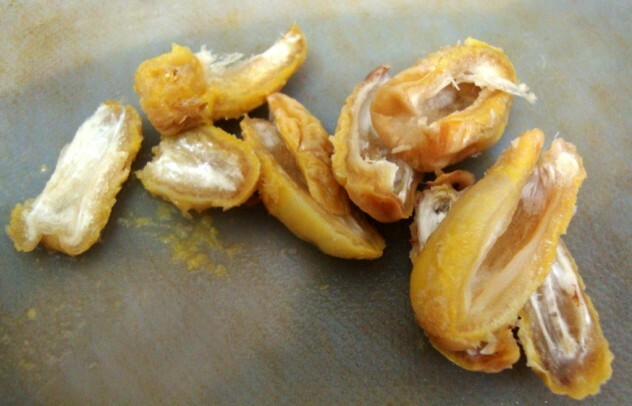 Remove the seeds and halve them. You can use the water that it was soaked it. Chop the Drumsticks, Yam, have the Jaggary, Green Chilies, Ginger ready. Add all this to the cooked dal along with water. Then add Coriander and Cumin powder. 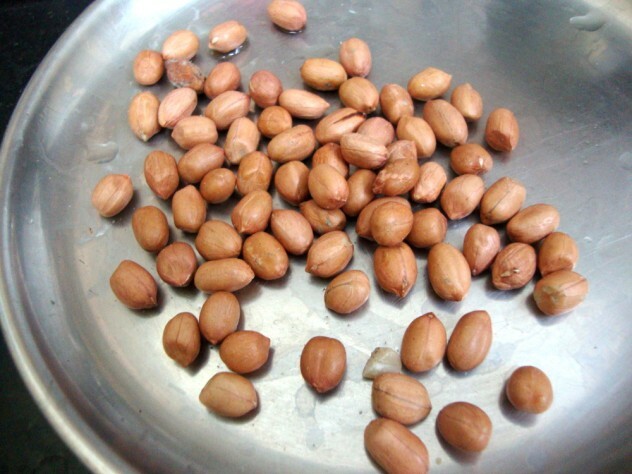 Next goes the raw groundnut into the dal. Dhal cooking in the final stage. 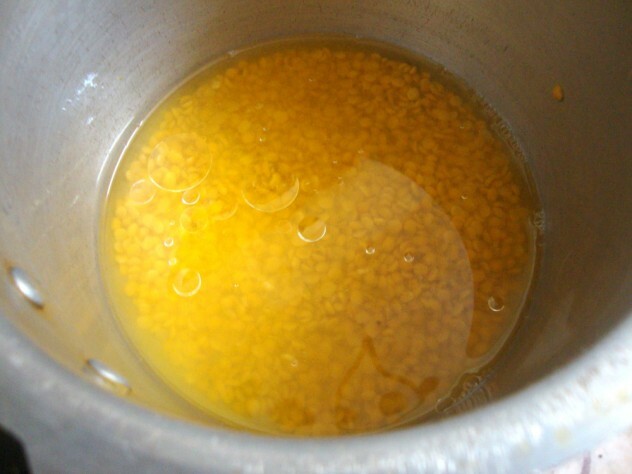 Wash the Toor dal and take it in a pressure cooker, add enough water to cover the lentils, add turmeric powder and oil. Pressure cook for 4 -5 whistles or till the dal is well cooked. 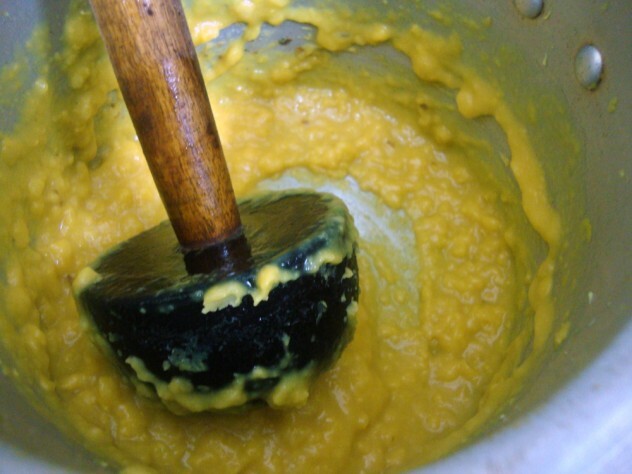 Once the pressure falls, churn the dal well. 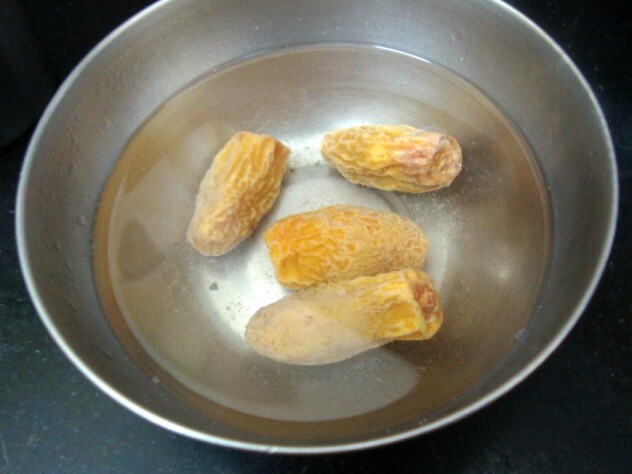 Soak the dried dates in hot water for 10 mins. Since I felt I might not be able to cook this dal for long as it is expected too, I pressure cooked it for 1 whistle for the drumstick, dates, yam to get cooked. So remove the lid, add all the other ingredients (except garam masala, coriander leaves and tempering). Add 1 cup of water and simmer for another 15 mins, stirring occasionally. At this stage I felt that I might not have enough time to cook for that long so I pressure cooked and them simmered. Pour this tempering into the simmering dal. Continue to boil for another 5 mins. 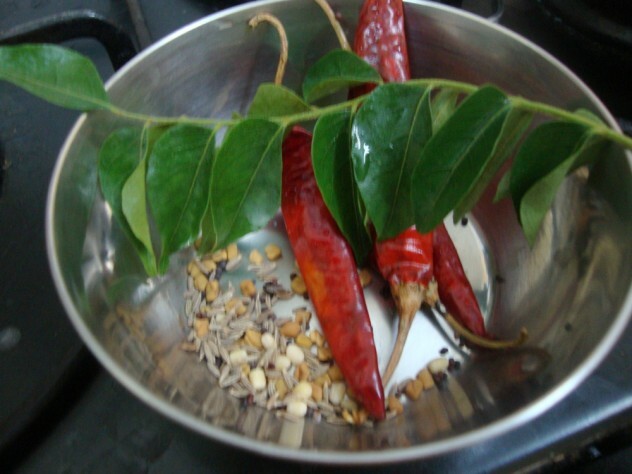 Remove from stove, garnish with garam masala and fresh coriander leaves. 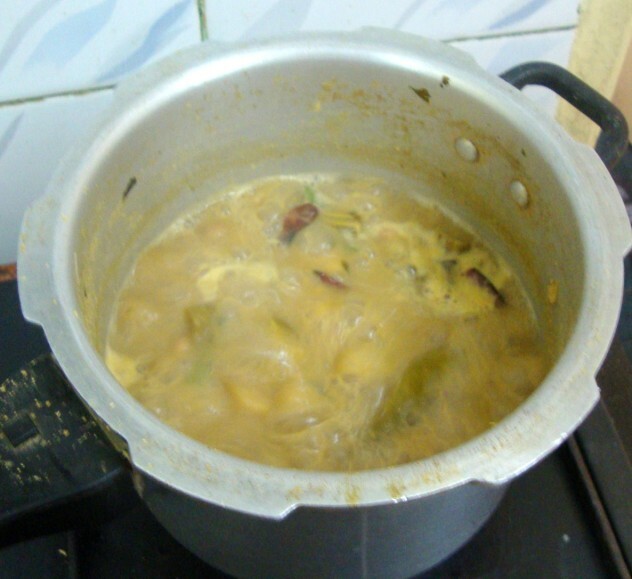 When I started with boiling the dal with all the ingredients, I felt the dal might be too thin. But it was quite thick and creamy when I finished cooking. On hind sight I need not have pressure cooked the dal with all the ingredients as I ended up cooking for a while. Anyways I was happy the dal turned out so well. 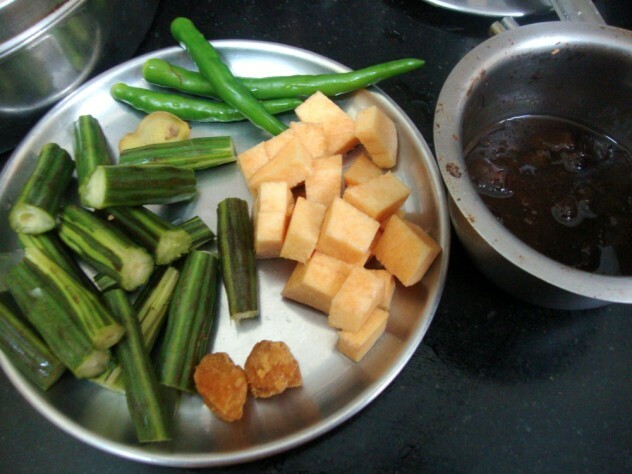 All the vegetarians at home really enjoyed and kids will love to eat this with rice. Though we normally add raw groundnuts to dishes like pulusu which is mostly without dals, adding this to a dal was really so wonderful. I loved munching on those dried dates and will surely look out to get my hands on Kokam to make this dal again with it. To all my ICC members, please link your Gujarati Dal post to Mr. Linky. soo nice Srivalli…I am so sad that I couldn't join in…first I didn't have all that required,so I left it to the end, then something urgent came up! your dal looks good!…I will make it for sure some day! The dates must give a little bit of a sweetness to the dal. I would have thought they add jaggery to make it sweet. Nice recipe! Naak ooring, Valli – Love the step by step dear! Lovely dal..I have never cooked with yam and because of the blogging marathon and other hard pressing issues, I had no time to go look for the ingredients, so I won't be posting in ICC this month. The link-up link doesn't seem to be there/working? Hi Srivalli, Posted my recipe and linked it. 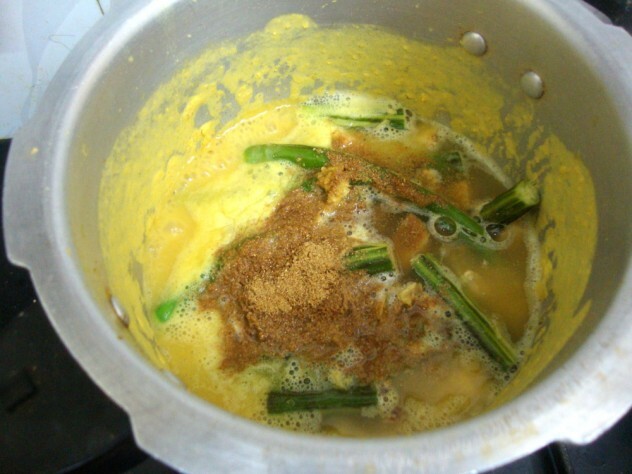 Hi srivalli… your daal looks so nice..I have posted mine…thanks. looks good.DH not in town…so i didnt make it this time. The recipe looks grt.DH not in town…so i didnt make it this time. 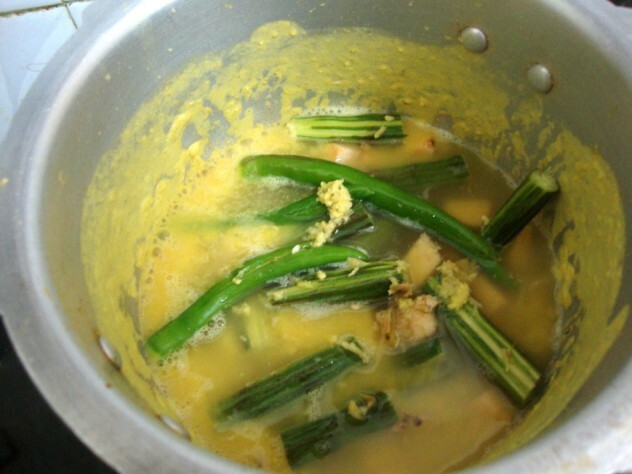 Lovely pics…I enjoyed the dal immensely. recipe really sounds different and interesting..a must try..and alovely picture..
Great Recipe, Lovely Blog. I would like to share an award I received from Shilpi. Please do collect it at my blog. Lovely dal and gr8 clicks.. I loved the unique taste of this yummy dal. Thanks to you, Pratibha and Jigyasa. What a nutritious and delicious dal Valli. It turned out excellent even though I made some changes due to lack of availability of ingredients. Thanks for choosing this dish. Valli, linked my post now.. It was simple and quick besides being delicious. Thanks for choosing this for ICC. BTW, as mentioned before, I am waiting for the next marathon. :))Please do let me know about it. hi valli, it was delicious, quickie recipe!!! Loved making it!!!! Didnt have drumstick handy!!!! Sure going to try again sometime!!!! Looks very healthy valli..will try it out!! Your cup of dal looks so delicious with those drumsticks missing them:(.Posted my recipe for ICC and linked it here Thanks for choosing this delicious recipe Valli. Yay! I could pitch in this month's challenge in the last minute!! Have linked it above! Thanks Srivalli, for choosing this delicious dal. thanks for correcting my mistake, I am not sure what happened. but I think its fine now? Looks healthy & I bookmarked it valli!! 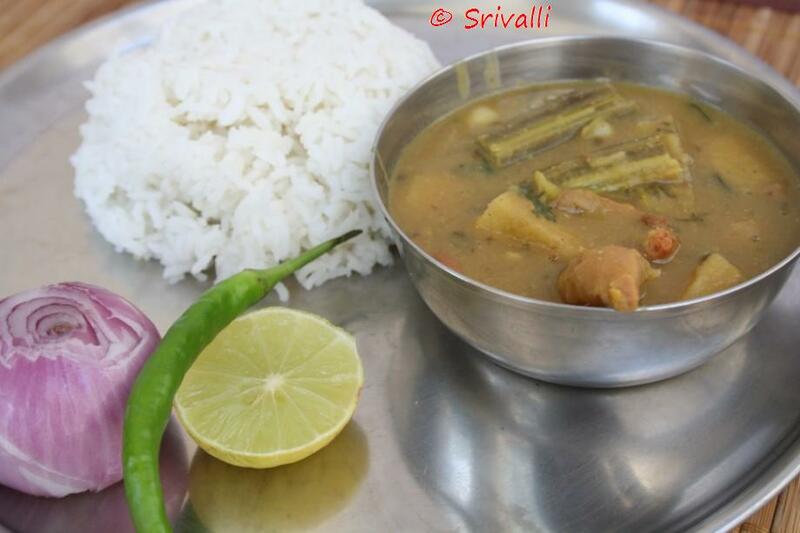 Very nice recipe Srivalli….looks yummy and healthy too!! Finally, my post is up. Very tasty and enjoyed by all at home.